Lorises have got strong jaw muscles and pointed teeth with cutting edges easily piercing human skin or thin gloves. Handling with its stress for the animal and danger for humans can often be avoided by catching animals with a cage in connection with some live insects as a reward. Health problems after slow loris bites may be either due to presence of a toxin produced by the animals, due to bacteria and viruses transferred by bites (N. Rowe, pers. comm.) or due to an anaphylactic shock (extreme allergic reaction) 78. Severe health problems and occasional deaths of humans from slow loris venom have been reported 78. Loris brachial gland secretion includes two toxins, made inactive by inhibitors; if mixed with saliva, for instance after licking of the brachial glands, the enzymes from the saliva break down the inhibitors and make the saliva-secretion mixture toxic (76, 77, N. Rowe, pers. comm.). Dentition of a slender loris. Lorises have powerful jaw muscles and teeth with sharp edges, and since they are shy, excitable animals, unforeseen bites are always possible. Lorises should not be kept as domestic pets, particularly in families with children! In zoos, handling should be done by skilled animal keepers wearing gloves or, less stressful, by training and use of cage traps instead of seizing the animals - after taming, lorises soon learn to enter such a cage for a reward. Loris bites are painful and often heal slowly because of bacterial flora on the teeth; severe disease and death of humans due to the effect of a poison produced in loris or potto skin glands have been reported. Photos: courtesy of Helena Fitch-Snyder. Anaphylactic shock: in people regularly in contact with slow lorises, saliva may repeatedly come into the body through tiny, maybe invisible wounds. If the loris keeper develops an allergy against this saliva, an allergic shock is possible (independant from the quantity of substance causing it, within seconds to minutes, in one case described lasting two hours), although this is a rare disease. Symptoms of anaphylactic shock may be: initially burning tongue and throat, a sensation of heat, red, itching skin, wheals, very low blood pressure, shock, convulsions of muscles (pain), pain in the heart and kidney region, respiratory problems (constriction of airways), heart problems, and possibly unconsciousness. Occurrence would make an immediate call for medicinal help necessary; first aid: measures against shock such as lying posture with legs a bit higher, assuring sufficient blood supply for necessary organs. Cases described: 78, 85, additional information about anaphylactic shock: 5, 110. Use of protective gloves when handling lorises. Stiff, thick leather gloves do not allow cautious handling; instead in some facilities stainless steel metal mesh gloves are used, which are available as protective equipment for butchers or veterinarians (Prof. Rumpler, Strasboug University, pers. comm. ), see for instance PerfectFit metal mesh glove page. Such gloves are more flexible than stiff thick leather gloves and protect against cut, slash and laceration hazards; additional safety may be provided by protection of the arm with metal mesh sleeves. Helena Fitch-Snyder recommends custom-made elbow length elk leather gloves (double thickness around the fingers) as thick enough to protect against bites even by large N. bengalensis, but more lightweight than metal gloves and still flexible enough. People threatened by anaphylactic shock, for instance suffering from a bee sting allergy, may keep an emergency kit within reach with contains adrenalin, cortisone and antihistamine. Cortison and antihistamine are also said to help reduce symptoms for instance after certain snake bites 111. Acquisition and use of such an emergency kit or other prophylactic measures should be based on consultation of a health professional. Wilson Howarth, J. 1999: Bugs, Bites and Bowels: the Cadogan guide to Healthy Travel. ISBN: 186011914X. Alterman, L., 1995. Toxins and toothcombs: potential allospecific chemical defense in Nycticebus and Perodicticus. In: Creatures of the Dark, Alterman, L., Doyle, G. and Izard, M.K. eds), pp. 413¬424. New York: Plenum Press. 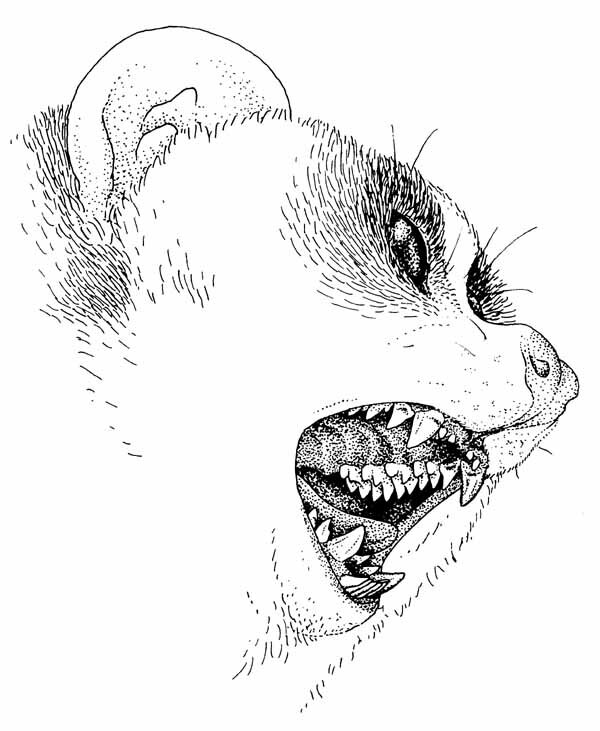 Hagey, L. R., Fry, B: G.; Fitch-Snyder, H., 2006: Talking Defensively: A Dual Use for the Brachial Gland Exudate of Slow and Pygmy Lorises. Pp. 253 - (274?) in: Gursky, S. and Nekaris, A., (eds): Primate anti-predator stretegies. Springer Verlag, New York, Inc.; ISBN: 0387348077. Wilde, H., 1972: Anaphylactic shock following bite by a 'slow loris', Nycticebus coucang. Am. J. Trop. Med. Hyg., Sep; 21 (2): 592-594.